On this Sunday of Lent we remember St. Gregory Palamas. St. Gregory was born into a noble family in Constantinople. He left all his wealth and prestige to pursue a life of prayer on Mt. Athos where he acquired great holiness beholding the uncreated light of God. Later, he became Archbishop of Thessalonica. St. Gregory defended the doctrine of the church that divine grace is uncreated. He also explained that we experience only this divine energy of God but not His essence, which is beyond understanding. This Gospel message carries several important lessons for our journey to salvation. The first is that we must come to Christ to be healed of our spiritual sicknesses. Christ did not just heal the paralytic but He also forgave his sins, which was more important. 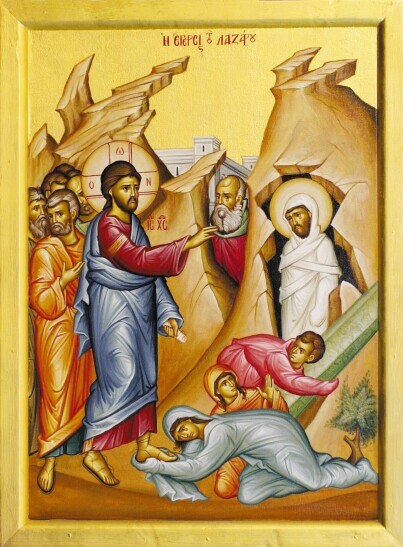 Just as the paralytic’s friends helped him, we as the Body of Christ need to help one another. The passage stresses that it was not the faith of the paralytic alone that made him well. Only when Jesus saw “their faith” did He forgive his sins and heal him. We can think of prayer, fasting, almsgiving, and obedience as the four friends that help us come before Christ and be healed. What is happening in this Gospel? Why was it so hard for the friends to get to Jesus with the paralytic? Why didn’t they give up trying? How was this man healed? How can we bring others to Christ? How can we be forgiven and healed by Jesus? What does this Gospel passage mean for our lives? Spiritual or Physical—Brainstorm different types of physical sickness we can have and then do the same for spiritual sicknesses. Next, make lists of how we can get well from both physical and spiritual sickness. Discuss how spiritual sickness can lead to physical sickness and then how physical sickness can lead to spiritual health. Thanks for Our Friends—Consider all the people, both family and friends, that have helped in your spiritual journey over the years. Consider doing something kind for them. It can be as simple as a letter with drawings from the children, honoring them with a special dinner, washing their car, or mowing their lawn. Him alone shall you love, and Him alone shall you worship with all your mind and all your heart and all your strength, and His sayings and His commandments will be in your heart to do them. To those who respect and worship Him, and who love and keep His commands, He promises and gives the heavenly kingdom and perpetual and painless life, and life immortal, and unsetting light to enjoy. Seek nothing other than to fear Him, to love Him, and to walk in all His ways. This is your boast, and this is your God. In the world you have lived a life of blessedness, and now in heaven you do rejoice in the assembly of the blessed; because you were meek, you dwell in the land that the meek inherit, O Bishop Gregory. God has made you rich in the grace of working miracles, which you do bestow on those who honor you. The mouth of the righteous shall meditate on wisdom, and his tongue shall speak of judgment (Psalm 36:30). O blessed saint, you have planted the dogmas of Orthodoxy and cut down the thorns of heresy. With your words you have watered the seed of the Faith, making it grow, and as an active tiller of the soil you have brought to God ears of wheat increased a hundredfold. Your priests, O Lord, shall be clothed in righteousness, and Your saints shall rejoice (Psalm 131:9). The glory of your blameless life, O blessed saint, amazed both angels and mankind. With steadfast purpose you have labored in the ascetic life, and shown yourself a worthy hierarch and minister of God and His true friend. Arise, O Lord my God, lift up Your hand: forget not Your poor forever (Psalm 9:33). Philokalia Volume 4—This collection of writings from various saints includes a chapter entitled “New Testament Decalogue” by St. Gregory Palamas. It examines the ten commandments in light of the New Testament. Read what this saint had to say about spiritual development. Published by Faber and Faber. The Creed by Anthony Coniaris—Children and families can use this book to begin understanding the teachings and beliefs of our Orthodox Church. Published by Light and Life Publishing. St. Gregory Palamas Monastery—The monastery’s has a Web site offers spiritual food for those on their spiritual journey. Visit the site atwww.sgpm.goarch.org.